After two years in the planning, the Landscape Horticulture Department announces its new Urban Arboriculture Program starting this Fall and offering both a degree and two certificates in this popular career of planting and maintaining trees. 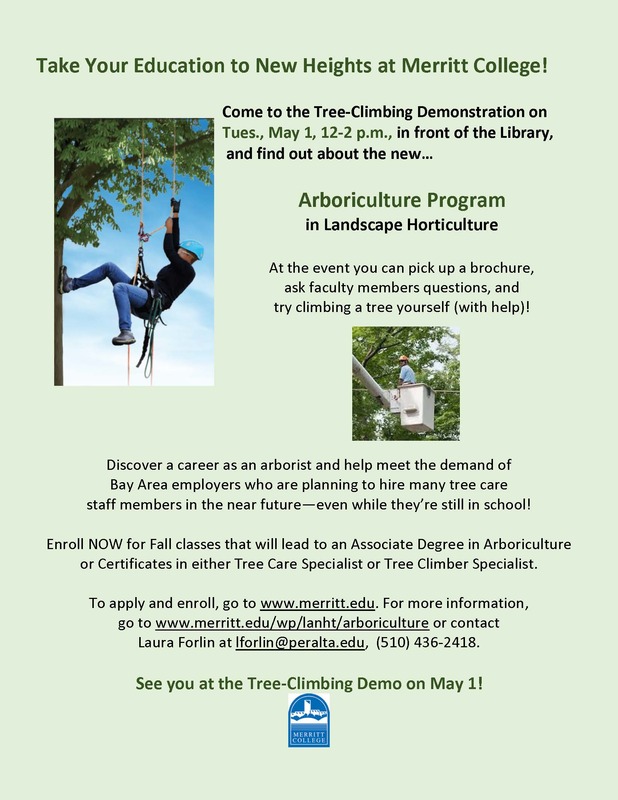 To help introduce the new program, the Landscape Horticulture Merritt community is inviting the Merritt community and beyond to a tree-climbing demo with a chance to hop into a bucket and go up in a tree youself to see how it’s done close-up on Tuesday, May 1, from 12-2, in front of the Library. 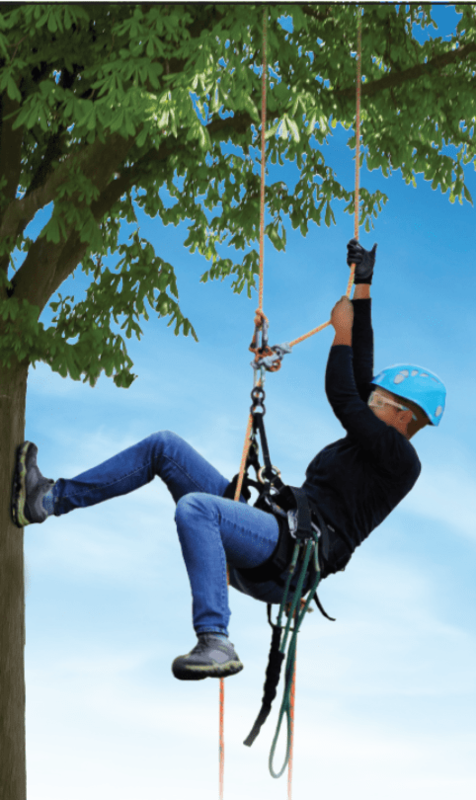 Besides the bucket truck, arborists will demonstrate climbing techniques to show how they work on the trees to maintain them, and bring a spray truck to show health-care applications. no programs to train them. Local and national companies from the tree industry approached Merritt’s highly reputable Landscape Horticulture Department and asked for help. It was an offer that Laura Forlin, Co-Chair of the Landscape Horticulture Department, couldn’t refuse. Their work has resulted in the creation of a two-year Associate of Degree in Arboriculture and two Certificate of Achievement programs in Tree Care Specialist and Tree Climber Specialist. This Fall, there are six courses offered for students to start the program, and Laura has already had lots of interest from potential students. In fact, several of the company representatives who asked for the program will be the instructors. “We have received a tremendous amount of support from the local tree companies, like Aplus Trees, Arborwell, and Davey Tree Expert, and from the national Tree Care Industry Association (TCIA). Besides teaching in the program, many companies are serving on an advisory board to offer advice and support.